Preheat oven to 220°C. Grease and line a 20cm (base) springform cake pan. Process flour and butter in a food processor until mixture resembles fine breadcrumbs. Add water. Process to a soft pastry. Remove pastry and knead lightly. Place between 2 sheets of baking paper. Roll out to a 23cm circle. Use pastry to line base and half-way up sides of pan. Refrigerate for 30 minutes. Preheat grill on high. Grill zucchini, capsicum and asparagus for 2 to 3 minutes each side, or until tender. Cool. 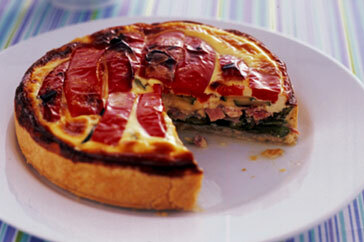 Layer ham, cheese and vegetables over pastry. Combine eggs, sour cream, and salt and pepper. Pour over vegetables. Place cake pan onto a baking tray. Bake for 15 minutes. Reduce temperature to 190°C. Bake a further 50 to 60 minutes, or until firm. Serve with dressed salad.